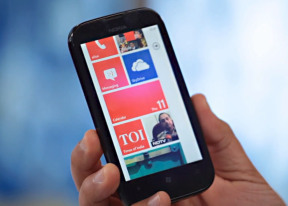 I love my phone Nokia lumia 510 I request to have my WhatsApp to be renew to enable me chat with friends, thank you. Want to know, reading a message, it is very small, enlarge the fonts, how? Nokia lumia 510 is bed phone bcs..the download mp3 and vedio by Zune application..
Poor, bad, worst, third class phone by Nokia. totally disappointed. very very bad experience. please dont buy this phone. Cant play games smoothly, loudspeaker volume is very low and bad quality. apps like Whatsapp, facebook take so much time for opening and Run very slow. Heat while surf net or play games. And so many -ve points are there. Very irritating phone. Screen is good , touch sense is awesome and body design is also good. But dont buy. When I m calling or have a call I can't disconnect all button blocked.any help?